A couple of weeks ago, I had the privilege of speaking to a young woman with great potential. She is brilliant in many areas of her life, but she was drowning in hopelessness because of a few poor decisions made in her past. The guilt was eating her alive while her gifts were suffering significantly. We had a long productive conversation about getting rid of guilt and moving forward with the blessing in her life. How many people in your life are functional for the most part, but are battling hopelessness in their life? It could be a spouse, child, friend, co-worker, church member, etc. We all face things that attempt to steal our hope. Hope gives us the feeling that things will turn out for the best. 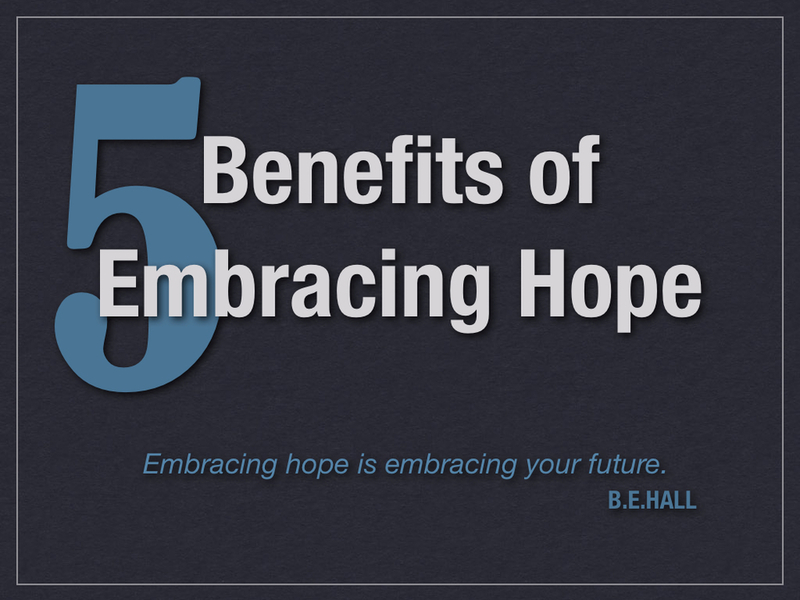 There are 5 Benefits of Embracing Hope. I believe many of our problems in our world today stem from a lack of hope. When you know there’s hope, you worry less. Worrying less means less stress. Faith is a necessity. It’s always good thing to increase your faith, which is the ability to visualize something not yet evident to the human eye. Hope allows you to see your future brighter than it presently may be. Once we receive the benefit of increasing our faith from embracing hope, others around us also receive the benefit of increasing their hope and faith. One of the greatest gifts aside from love the love of God is giving someone the ability to hope and believe in God. Hope gives you a sense of peace because you start to realize who has all POWER! Living with less stress and a greater faith will all point to our Creator because he is all-knowing, all-merciful, all-present, and all-powerful. Knowing these facts gives you more control over your life. You have more control because you are able to carry out the purpose in which you were created for by the Creator. One of the delightful benefits of hope is being able to glorify our Father. Since he created us and sustains our very being, we should be excited to please Him. God wants for the entire world to know and love Him. Action: Look pass the past guilt and disappointment, and start looking forward to your hopeful future.